Experts at Ayurveda workshop give tips to keep lifestyle ailments away. TARINI PURI reports. Did you know that some basic spices in the kitchen such as ginger, garlic and turmeric can help keep serious ailments, including coronary artery disease (CAD), at bay? Adopting an Ayurvedic lifestyle can be the answer to many modern lifestyle diseases, said Dr Raj Kumar Sharma, an authority on Ayurveda currently touring Australia. 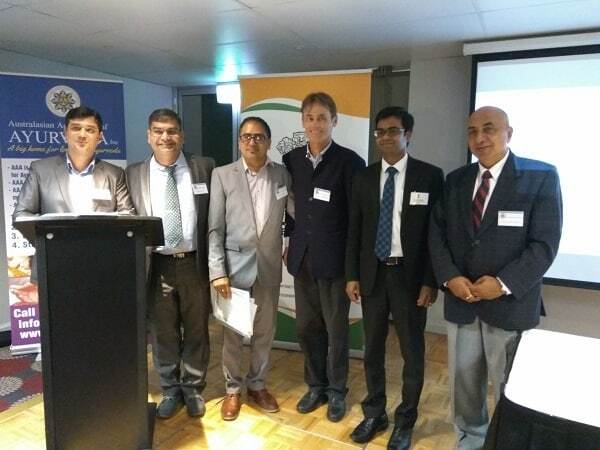 He was speaking at a recent workshop on Ayurveda organised at the Parramatta RSL by the Consulate General of India, Sydney, in association with the Australasian Association of Ayurveda (AAA) NSW, to popularise the alternative form of medicine. According to Dr Sharma – one of the two speakers at the workshop – incorrect dietary choices, sedentary lifestyle, excessive stress and genetics are responsible for most modern-day lifestyle diseases. 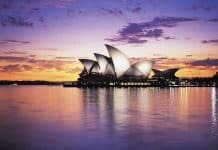 Citing Australian CAD data of 2011-12, he informed the audience that two persons die in the country every hour because of the high prevalence of coronary artery disease. However, this can be managed and reversed by adopting an Ayurvedic lifestyle, he assured. Dr Sharma is a professor of the basic principles of Ayurveda at Dayanand Ayurvedic College in Jalandhar in Punjab, India. 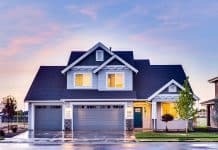 He is also its trainer and assessor in Australia. The second speaker, Sydney-based holistic GP and author Dr Shaun Mathews, introduced the audience to the five-element theory encompassing earth, water, fire, air and ether (space) which, he explained, govern the three body types – vata, pitta and kapha. Dr Mathews stressed the importance of mental and spiritual health in overall well-being. “Just sitting down in the park with your family on a Sunday afternoon is important too,” he observed. He also emphasised the role of sight, sound and smell to explain the significance of aromatherapy and massage in Ayurveda. The event was attended not only by doctors and health enthusiasts, but also attracted many from the mainstream community. The audience was introduced to health benefits of ordinary kitchen items, besides herbs such as Arjuna (Terminalia arjuna), Gugulu (Commiphora wightii), Pushkarmool (Inula racemosa), Chitrak (Plunmbago zeylanicum) etc, in the management and reversal of atherosclerosis or hardening of the arteries which can lead to not only coronary artery disease, but also brain stroke. 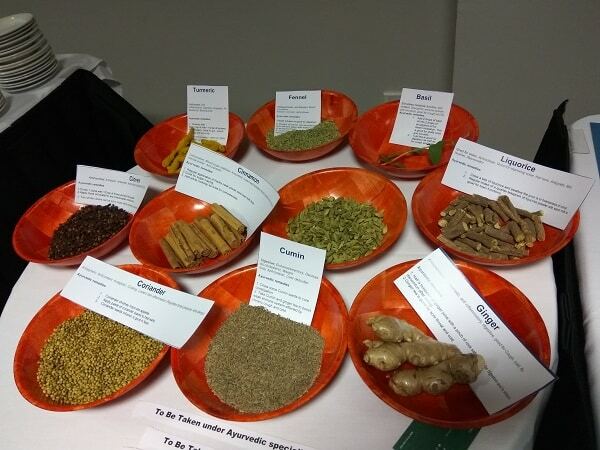 The audience also got to see many items of Ayurvedic use – including herbs, spices and the items used in Ayurvedic therapies – at the display tables set up at one end of the room. The event started with the MC, Dr Vishal Sharma, urging members of the audience to close their eyes and breathe deeply. The mood for the evening was further set by students of Sydney Sanskrit School who recited shlokas to invoke peace, wisdom and learning. This followed the lighting of the lamp before the image of Lord Dhanvantari, the god of Ayurveda, by Chandru Appar, Consul (trade and commerce), and Dr Farida Irani, a seasoned Sydney-based Ayurveda practitioner. Dr Naveen Shukla, the NSW representative of AAA, started the workshop by stressing the importance of preserving and popularising the ancient Indian form of medicine. 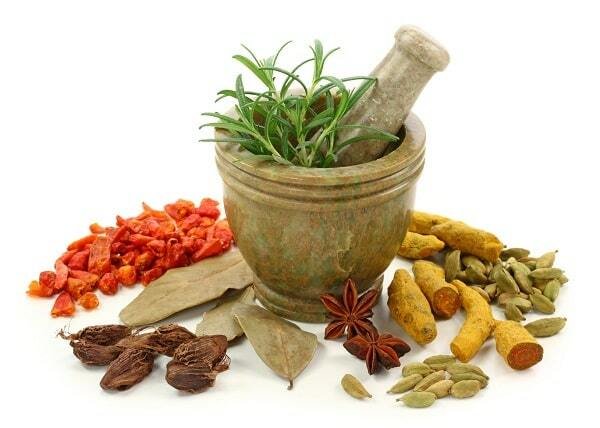 “Ayurveda is believed to be as old as civilisation. The governing principles of nature govern our body too and this is at the base of the Ayurvedic lifestyle. It’s unfortunate that, so far, it has not got the attention it deserves. We need to promote and help save our precious heritage,” he said. In February this year, the Indian government instructed all its establishments in foreign lands to take concrete steps to promote Ayurveda. The Sydney workshop was the fourth part of the awareness initiative undertaken by the AAA across the country. “More such awareness sessions are in the pipeline,” Dr Santosh Yadav, president of the association said. 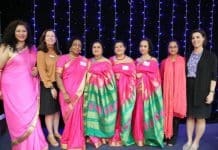 The Australasian Association of Ayurveda Inc (AAA) is the national voice of Ayurveda for its 50-odd qualified member-doctors. It is recognised nationally by a number of health funds and is working to expand that number to recognise Ayurvedic consultation as a bona fide treatment.